This is the number of people you invite to take your survey. It could be a “census” in which you ask everyone in your audience or it could be a “sample” where you only invite a proportion of people. This the number of completed responses you receive for your survey. Note that you might also count partially completed responses if they provide valuable information for your business. The calculation for response rate is simple: it is the number of responses divided by the number of people you invited to respond. The number is generally reported as a percentage, e.g. a 25% response rate. Technically speaking, a good response rate is one that is higher than the minimum acceptable report rate, see more below. Practically speaking, a good survey response rate is one that is above average and, based on some industry data (see below), that would be anything above 25%, subject to having enough total responses. More on that later. At Genroe our experience, for well crafted customer feedback surveys, is a response rate of between 10% and 30% depending on how engaged the audience is with the company. A good good NPS response rate is one that is above around 20%, subject to having enough total responses. You can see from this data published by CustomerGauge, using their extensive CustomerGauge NPS Benchmarks Survey, that most organisations (~51%) have response rates of 20% or higher. If your response rate is below that figure you might like to review how you might improve your response rate. If you’ve ever tried to understand the statistical terms around error and confidence intervals it’s easy to become confused. So just quickly I want summarise the meaning of each for clarity. Standard Error – is a generic term that applies to many types of sample statistics (mean, standard deviation, correlation, etc). When we talk about Averages, the Standard Error is equal to the Standard Deviation of the sample. Margin of Error – the amount within which you are confident (e.g. 90%, 95%) that the population mean is above or below the sample mean. Now we have a handle on the basic statistical terms lets look at what makes a response rate “acceptable”. In this context an acceptable survey response rate is one that allows you to use the information collected in the survey to make decisions in your business. That rate can vary dramatically. In these cases the acceptable response rate will be the statistically valid survey response rate. There are a few things that affect that and here is the calculation for the number of responses required. σ is related to how much inherent variation there is in the population: does almost everyone give you a 5 or 6, or do you get a wide range of scores all the way from 1’s up to 7’s. As you can see, the number of responses is very important and that, along with the number of invitees, drives the minimum required response rate. Let’s move on to a practical use of this information. Above I talked about Standard Error. When determining an acceptable response rate this is a very important idea. What we need to do now is to find the minimum number of responses that will give us the maximum error that we are happy to accept. That will then give us our acceptable response rate. How many responses do we need, so we are confident the average is in the range of x +/- y. We can do this with the equations above, just re-arranged a bit. Here is a practical example where we want to be 95% certain that the average is in a range of +/- 0.5 on a 1-5 response scale. Here the minimum number of responses we need to be sure we are within that error range is 9, and so the acceptable response rate is 9%. Note: This calculator ignores non-response bias, i.e. it assumes responses are evenly spread among the entire population. See below for more information. If you have a very large population then you may have a very small response rate but a large number of actual responses. Take for example political polling. These polls try to forecast the winners of elections by surveying a very small proportion of voters. You can see in the image below that the response rates are very small, e.g. just 0.0011% (1,690/ 146,311,000) but the data is still useful. Note: strictly speaking this example doesn’t show response rates as not all voters were invited to respond. In this case I am using opinion polls to make the point that it’s not just the percentage of responses that are important but also the total number of responses. Above and beyond the strictly mathematical, there are other considerations when deciding if your response rate is high enough. Sometimes you may be concerned about the skewing of results because one group of customers does not respond at the same rate as other groups. 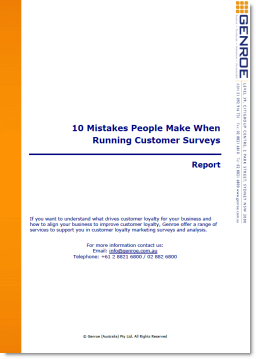 Typically, for customer surveys, the very happy and very unhappy respond more than the middle group who are neutral. Non response happens when there is a significant difference between those who responded to your survey and those who did not. In practice addressing this can sometimes be important but doing so is problematic and there is no consistent and practical way to address the issue in this context. The acceptable survey response rate is not one number but a range of numbers – so you first have to decide what you want to know. Very thorough explanation in regards to survey response rate. Keep it up Adam! I’m not sure what you mean “per research type”. The statistics are the same regardless of which approach you take and the calculations are the same for e-mailed questionnaires as for paper or for that matter telephone interviews. Very insightful and applicable – thanks, Adam. Question: in your response rate calculator, the actual number of responses used to measure the STDEV (168) is different than the Number of Responses (20) used in your Response rate calculation. What’s the difference? I can see what you mean and it is confusing. I didn’t use a calculated column for number of responses, just hard entered the number and it was not consistent with the other values. I’ve now updated the spreadsheet to automatically count the number of responses to eliminate the confusion. I am a Professor and our Department teaches a survey course. I like what you put out and find it useful, but I have two issues. The first is that you almost completely ignore nonresponse bias in your discussion. It can be an important factor when response rates are below 50%. It looks like your calculator treats the actual responses as random, such that nonresponse only results in a smaller sample size. That is rarely the case. One other point. In looking at national opinion polls you indicated the response rate as a percent of the population, not as a percent of the invited audience. That is not the response rate. National opinion polls use substitution and other methods to make it difficult to determine response rates. However, the entire voting population is not the invited audience. Non-response bias: I agree this is not addressed and can be important but doing so is problematic. (yes, the calculator does assume the responses are random). I don’t know of any practical way to address this issue in this context so have so make an implicit assumption that the responses are random. I do allude to this issue in the “Skewing of results” section but I’ll add a note making this assumption explicit where it is used. Invited audience: you are correct. In this case the example of opinion polls used to make the point that it’s not just the percentage of responses that are important but also the total number of responses. I’ll add a note to make that clear as well.